ntsocialism. : What's brewing in Bangalore. A budding city in Asia and although at times unfashionable, Bangalore makes up for their flaws by being a centre for technology and the pious. However, you would be sorely mistaken if you thought Bangalore, the IT hub of India, has caved in to the demands of Western conglomerates’ and allowed full access (or should I say penetration) to their local food & beverage market. Granted, the level of income in today’s working class India probably doesn’t appeal to these multinational companies. Spending power remains at an average but as always with developing countries, the ‘crème of the crop’ middle-class citizens and the expatriates stationed here want to indulge in cafe culture and surely wouldn’t mind forking out the extra bit for a connoisseur’s experience. Where there’s an opportunity, there you’d find an intelligent businessman busy building his empire. 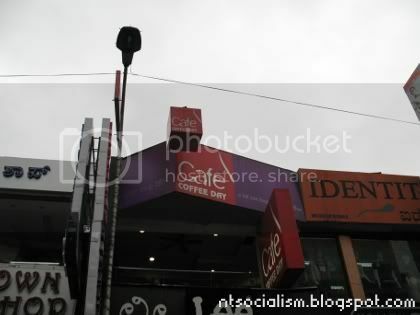 Enter Coffee Day, Bangalore’s successful and modestly styled bistro. It has all the likeness to a full-blown upmarket coffee chain outlet, minus the bourgeois. The franchise is sprouting almost everywhere in the city area prompting rumours that its owner, Mr. V.G. Siddartha is planning a domestic dominance with 160 outlets planned for Bangalore alone (as quoted by an insider). Judging from current outlet count at 134 (in Bangalore alone) and 647 (in the whole of India), coupled with the insatiable appetite of young and modern Bangaloreans for all things sweet, I’d be the last to doubt his vision! 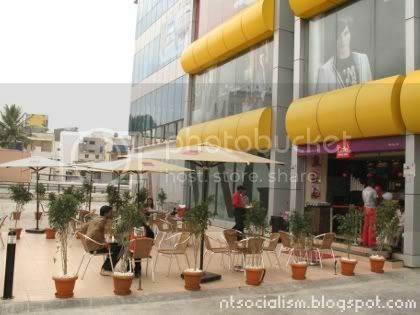 Coffee Day outlets are designed and furnished in a fairly simple manner; painted in red, brown and beige; with limited seating areas. 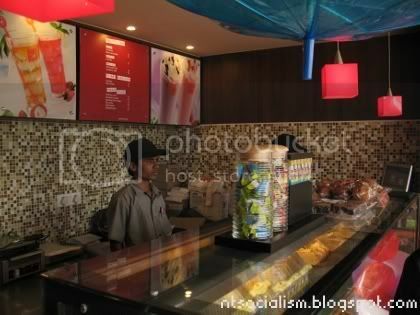 Some outlets have petite-looking bar areas which are restrictive to staff members when handling brisk business. 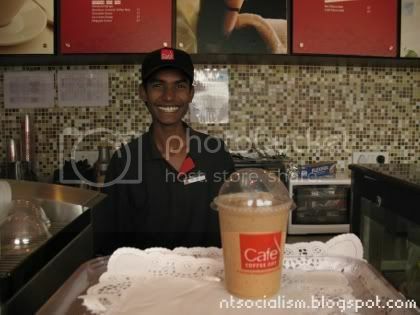 Despite that, it is remarkable the way Coffee Day staff members get on with their day with such enthusiasm towards customers. 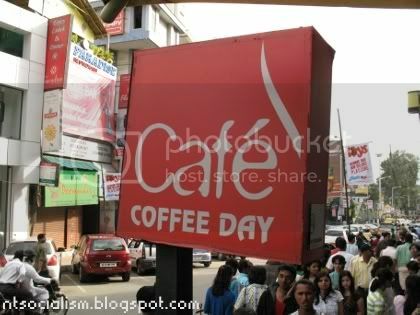 In regards to their products, Coffee Day offers customers a comprehensive array of products available on their jocularly composed menu. Beverages include staple favourites (espresso, latte, cappuccino, macchiato and black coffee), gourmet blends (Aztec and Ethiopian), ice blended assortments (trademarked as ‘Cold Sparkle’, ‘Tropical Iceberg’, ‘Iced Eskimo’ and ‘Kaapi Nirvana™’), cream blended selections (cafe frappe, ‘Devil’s Own’ and choco frappe), tea selections (‘Masala Garam’, ‘Assam Express’, ‘Darjeeling Divine’ and ‘Lemon Demon’), non-coffee based varieties (‘Lemon Freeze’, ‘Strawbrrrrrrry’ and ‘Lychee Thanda’, Fruiteazers (consisting of shakes, granitas and spritzers) and last but not least Freeze Frames (ice-cream desserts). For the fairly hungry, Coffee Day’s fresh from the oven goodies (cookies, croissants, sandwiches, cakes, doughnuts and muffins) are there to save the day! Other than Coffee Day, there’s virtually no other proper cafe franchise available for the public to patronise. 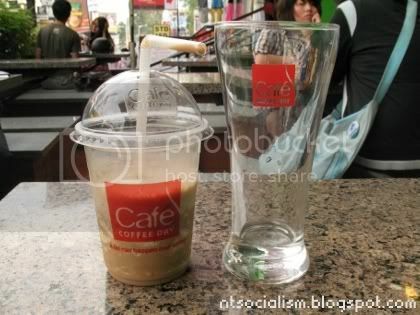 It’s a huge wonder why Starbucks or Coffee Bean & Tea Leaf haven’t entered their market. Suppose political head honchos haven’t been put to work to allow this to happen. Fortunately, locals here are rightfully content with a highly efficient and cost-friendly Coffee Day. In the long term though, I think globalisation and competition should just be allowed to take its course so as to improve the cafe connoisseurs’ experience in Bangalore. Instead of whining about the lack of coffee house franchises I have to choose from, I decided to give a few of their listed drinks a try. To the seasoned coffee drinker who might want to upsize their orders, that option is sadly unavailable. Often packed to the brim, it must be remarked that their outlets often have problems taking up ice blended drink orders especially in mall outlets; quoting stock depletion as a single source of reason. Of all their ice-blended drinks, Kaapi Nirvana™, their award winning flagship beverage, ranks as a personal recommendation – just get them to go easy on the cream topping. Most coffee orders served here are extremely sweet! 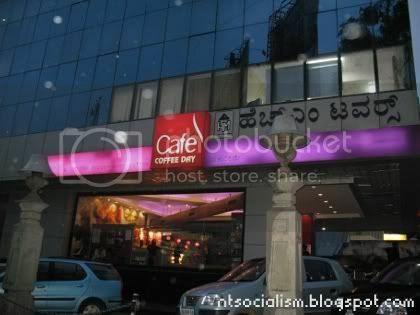 Cafe culture here in Bangalore, from my observation, remains an untapped and partially ventured market in India. Tea remains their favourite type of beverage and with only one sole coffee house franchise dominating the scene it is hardly a surprise that you don’t necessarily get a ‘bang for your buck’ when patronising their outlets. 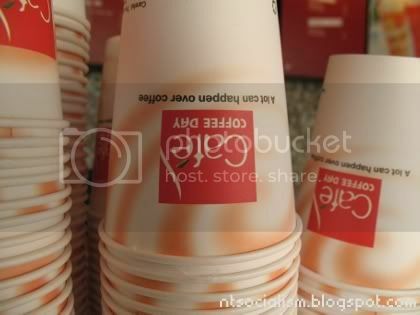 There is however so much potential that Coffee Day can strive better to deliver while they’re still a big player in the local business. After all, a lot can happen over their coffee, can't it?